After an award-winning career in advertising, Jim Liggett decided to turn another one of his passions -- soap making -- into a career. But he didn't want to make and sell traditional soap. Instead, he turned to an old New England recipe for bar shampoo he had found tucked into a cookbook. 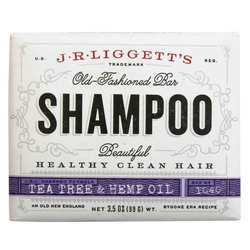 After making the shampoo to give out as gifts for years, all the positive feedback inspired Liggett and his wife to move to a farm in New Hampshire and make old-fashioned bar shampoo full time. Liggett uses only pure, natural oils and no detergents, so hair retains its natural oils. You won't even need conditioner after! The bar shape makes it perfect for traveling and even exploring the great outdoors. J.R. Liggett's offers a 100 percent money back guarantee on all their products. If you're not satisfied with your product, return the item and your original receipt to J.R. Liggett's corporate headquarters, 973 NHRT 12A, Cornish, NH 03745. We are an authorized distributor for J.R. Liggett's. We offer fast, reliable shipping from the United States to Australia on all J.R. Liggett's products so you will consistently receive the lowest price and biggest savings by importing directly to your doorstep.